Concrete. Ghazal. Lai. Pantoum. Rondeau. Rubáiyát. Sestina. Skaldic verse. Sonnet. Terza rima. Triolet. Tritina. Villanelle. 2008 Asilomar Haiku Retreat: Day 1. Yuki Teikei Haiku Society (YTHS) president Carol Steele, YTHS, treasurer Patricia J. Machmiller, and YTHS Board Member donnalynn chase brought us together with warm opening welcomes. We remembered absent friends: Jim Arnold and an early and active YTHS member, Mary Hill, whose bamboo garden had been a celebrated site for the YTHS annual Tanabata celebration. Carol had brought a wide ceramic bowl planted with a miniature bamboo grove, in which we were invited to hang our haiku for Mary. recommended season words for haiku. sometimes a pause occurs naturally, as in noticing sunlight on the wall. She read from her new book Haiku Mind, in which she shows 108 haiku by modern and classical poets, with a meditation on each. "If we can forget the self," she said, "compassion naturally arises. So haiku is a practice of compassion." 2008 Asilomar Haiku Retreat: Day 2. Patricia J. Machmiller spoke of the importance of using a kigo in a haiku. The	kigo provides a poetic device (or mechanism) allowing the poet to evoke in haiku the associations through "stickiness" and "resonance" that a kigo brings. Sky and Elements. e.g. 'moon' (understood to be the full moon by default). Poets with an international sensitivity will be aware that the festivals of Autumn in the Northern Hemisphere are festival of Spring in the Southern Hemisphere; similarly, Christmas south of the equator occurs in the middle of summer. For such reasons, some international poets advocate minimal use of Human Affairs kigo that can have opposite meanings on opposite sides of the equator. deer. Also 'Asilomar deer' or 'black-tailed deer'. We took personal writing time to go for a ginkoo (a walk in which we would create haiku and tanka). We returned shortly before lunch for three rounds of sharing today's poems. The haiku is more than a literary form because it has a built-in meditative practice. Donegan's form is a one-breath poem, written in 3 lines, not necessarily of 5-7-5 syllables. Each haiku has a clear image. Each haiku contains one kigo (a season word or nature reference). She writes of the here and now; writing from memory is possible but not from imagination. 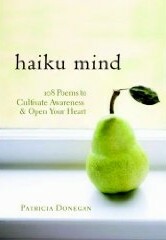 There is a place for feelings, if expressed subtly: "haiku's use of objectivity has been over-rated". And "show, don't tell". A poem should end with (or contain) a surprise, an "ah!" A poem should express compassion. She simplifies poems as much as possible, allowing the reader to make the "imagination jump" that fills in details. See clearly what is there; notice an "ah!" moment. Express the moment in a few words of haiku. After another ginkoo, we returned for a workshop with Donegan. She demonstrated techniques she attributed to Seishi Yamaguchi, cutting words from our haiku. I did not offer my 5-7-5 haiku (an easy target for cutting its last line and more). But the shorter haiku I offered was rather rewritten, yielding a different haiku from the original. Focus on one thing, one moment. Use no more than one verb. Traditional haiku groups in Japan follow the same calendar as traditional rituals, using the lunar calendar. This makes their seasons begin somewhat earlier than Westerners consider the seasons. Many modern Japanese haiku groups shift the season later in the calendar. At this point, choose either calendar but then be consistent in its use. If a haiku becomes complex or obscure, return to the original impetus. In removing words, beware that the haiku does not become too open with too many possibilities of interpretation; retain 'enough' information. Be willing to take a single experience and write it many different ways, rather than trying to tug the first attempt into an improvement that it resists. Keep returning to your original intent and trying again. In the evening, an introduction to the dreaded linked-verse form, the renku. And then a renku party, with two teams, one led by Jerry Ball and the other by Roger Abe. Both teams finished around the witching midnight hour. 2008 Asilomar Haiku Retreat: Day 3. Paint with a degradable (lamp-black) ink using sticks and stones. Make a multi-folded book from a single sheet of paper. Make a multi-leaved book held together with a twig and a rubber band. That afternoon, Emiko Miyashita, a delightful Japanese woman (who lives in Kawasaki and works on the Ginza in Tokyo), conducted a lively feedback workshop, from which we all benefited. Volunteers that submitted their work for public review each received a special reward: a beautiful hand-sewn bag, each made by her own mother. Also, Emiko Miyashita invited us to submit haiku in English for the Asahi weekly newspaper; she comments in Japanese on English-language haiku — a novel approach! In the evening (and as at the 2007 YTHS Retreat) Mariko Kitakubo in a traditional kimono performed her tanka in Japanese. Her gorgeous costume and graceful gestures enhanced the charm of the performance, as did the background music. Her official translator, Amelia Fielden, attended and read her English-language translation after each tanka. At the end of the performance, Amelia Fielden read some of her own work. 2008 Asilomar Haiku Retreat: Day 4. The closing circle was led by donnalynn chase. After goodbyes, goodbyes, detouring only to stop and listen to the ocean and watch hang-gliders take off and drift on threads and foil above Marina, I'm on the freeway for home. The Essential Haiku: Versions of Basho, Buson, and Issa edited by Robert Hass. The past-poet laureate of the U.S.A has compiled this enthralling collection of his own essays in which he summarizes the lives of three masters and inventors of the haiku tradition in Japan, and presents the lives, the prose, and 300 of the poems of: Matsuo Basho (1644-94), the ascetic and seeker, Yosa Buson (1716-83), the artist, and Kobayashi Issa (1763-1827), the humanist. Except for the haiku credited to individual poets.